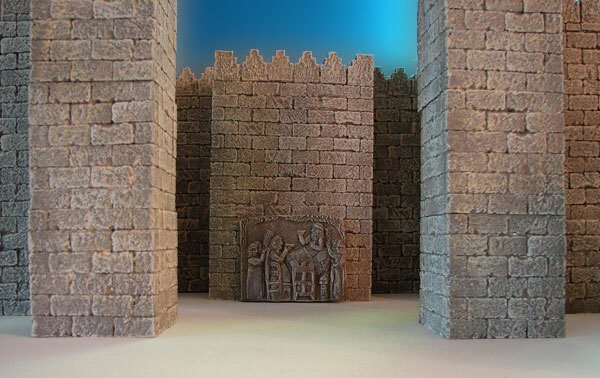 This miniature replica is of Ashurbanipal, King of Assyria, feasting in his royal garden with his queen. The bas-relief is from his palace at his ancient capital, Nineveh. His Biblical name was Asnapper. The panel was discovered at the site of ancient Nineveh during the reign of Ashurbanipal (668-626 BC). The original is located at the British Museum in London. The alabaster relief is part of a panel standing over 25 inches tall. - Limestone relief from the N. palace of Ashurbanipal at Nineveh, his capital. - Ashurbanipal reigned from 668-626 BC. - The detailed relief is 139 cm (4 1/2 feet) wide. - His wife Ashursharrat in a richly decorated robe is seated on an elegant throne with a footstool. - Excavated at the site of ancient Nineveh (Kuyunjik) by H. Rassam about 1847. - This stone panel is currently at the British Museum in London. - Nineveh (Kuyunjik) was Ashurbanipal's capital city (Northern Iraq). 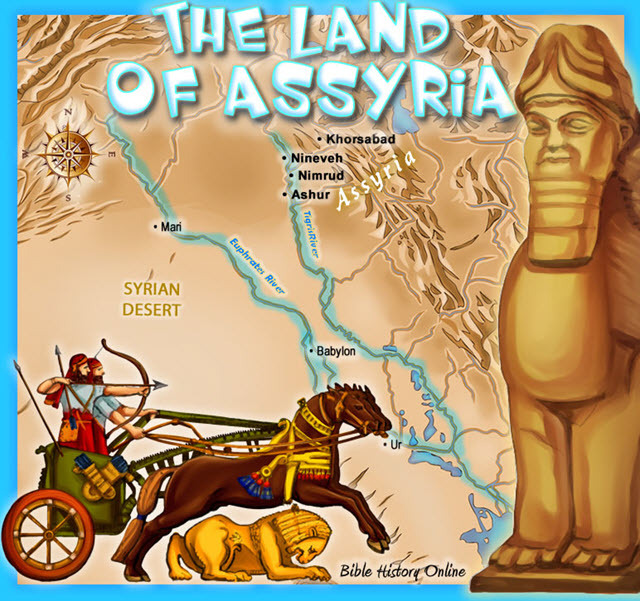 As one scholar eloquently puts it, "The Bible mentions "the great and noble Asnappar" who is actually Ashurbanipal, the son of Esarhaddon, who succeeded his father on the throne and reigned from 669-626 BC. He was the last of the great Assyrian kings. 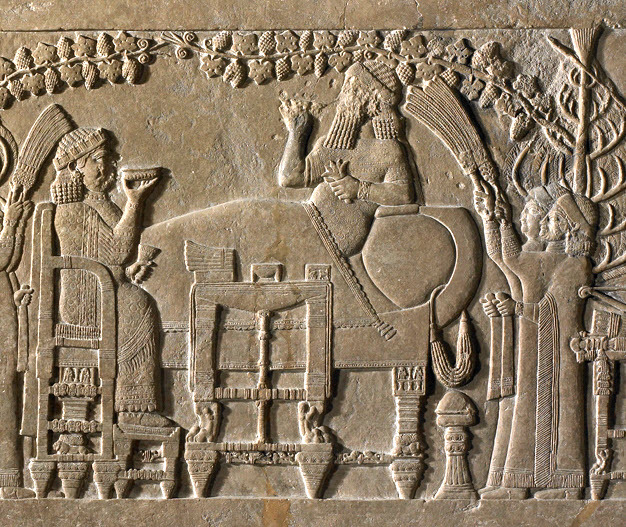 This relief scene was carved on alabaster and depicts the king of Assyria, Ashurbanipal, reclining on a well upholstered couch. He is in the royal park, which is planted with date palms, conifers and shrubs. Vine tendrils, leaves and grapes, shade the king. He is relaxed and has laid aside his weapons, sword, bows and arrows. He is wearing a headband with streamers and an embroidered coverlet with tassels at the corners is spread over his legs. With his right hand he raises a goblet to his lips, in his left hand he holds a flower. Beside the couch is a table laid with food. Opposite him is his wife Ashursharrat in a richly decorated robe sitting on an elegant throne with a footstool. She is also drinking. Servants bring them food and other servants wave fly-whisks. In the background a musician plays a lyre with 11 strings. Not such a peaceful scene because off in the left corner a head is hanging from a tree. This head might be the king of Elam because this scene Ashurbanipal is celebrating his victory over the Elamites at the battle of Susa in 655 BC." Asshurbanipal and his wife in a vine bower. 668-626 BC. *based on their recent victory over the Elamites at the Battle of the River Ulai, or of Til-Tuba. One inscription on a sculpture of Te-umman and Tamritu his first-born son being slain by Assyrian soldiers reads: "Te-umman, king of Elam, was wounded in fierce battle, and his eldest son Tamritu took him by the hand, and to save their lives they fled and hid themselves in a wood. With the help of the gods Ashur and Ishtar I [Ashur-bani-pal] seized them and I cut off their heads in the presence of each other." Another inscription on a sculpture of soldiers in a chariot who are carrying Te-umman's head to Assyria reads: "The head of Te-umman, king of Elam, which they had cut off in the battle in the sight of mine army as a symbol of glad tidings they carried quickly to Assyria."